Oakland, Calif., September 6, 2007 – Sylester Flowers, founder of Ramsell Holding Corporation, the parent company to healthcare-related businesses including Public Health Service Bureau, The Apothecary Pharmacy and Flowers Heritage Foundation and a long-standing public health advocate in the San Francisco Bay Area, was honored in a Resolution Presentation by the California State Senate. Mr. Flowers was recommended for the award by Senate President pro Tem Don Perata (D-Oakland). For this honor, Flowers participated in a Resolution Presentation session on the Senate Floor. Following the Senate Resolution, Mr. 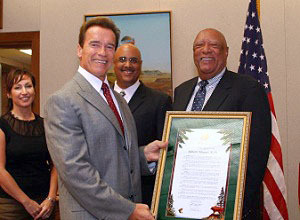 Flowers met with California Governor Arnold Schwarzenegger. Since coming to the Bay Area in 1962, Flowers has been deeply committed to addressing public health issues for the underserved. His passion for serving often marginalized communities can be seen in his professional and personal life. In 1964, Flowers opened the first of what became a chain of pharmacies in working-class neighborhoods in Oakland, California. Once the business became established, he founded Ramsell Corporation as a holding company for his successful pharmacies and expanded the business into managing pharmaceutical services. Beyond his business activities, Flowers has also served as a community leader, educator and scientist. He was Pharmacy Director for the San Francisco County Mental Health Department’s methadone treatment program from 1971 to1982. Flowers also held teaching positions as an adjunct professor of pharmacy at the University of the Pacific in Stockton, California and as an assistant clinical professor of pharmacy at the University of California School of Pharmacy in San Francisco, California. The Flowers Heritage Foundation is a non profit (501c3) organization dedicated to providing solutions for public health issues affecting the medically indigent through our expertise in public health care, education/awareness programs, technology, business management, and fundraising. Current programs include funding medications for ADAP waitlisted patients, and AIDS awareness programs for High School students. Flowers Heritage Foundation is based in Oakland, California. For more information, please visit www.flowersheritagefoundation.org.